The original Yankee Stadium, located at East 161st Street and River Avenue, served as the home baseball park of Major League Baseball's New York Yankees from 1923 to 1973 and, after extensive renovations, from 1976 to 2008. Nicknamed "The House that Ruth Built", it was the first three-tiered sports facility in the United States and one of the first baseball parks to be given the lasting title of stadium. 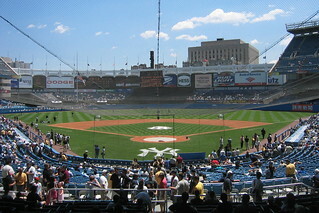 Yankee Stadium hosted 6,581 Yankees regular season home games, and 37 World Series during its 85-year history. Yankee Stadium was the home of the National Football League's New York Giants from 1956-1973, before they relocated ultimately to Giants Stadium in the Meadowlands, including the 1958 NFL championship game, and other short-lived professional football franchises including the three incarnations of the AFL's New York Yankees (1926, 1936-37, 1941), the AAFC's New York Yankees (1946-49), the NFL's New York Yanks (1950-51). It hosted three papal masses--Pope Paul VI (1965), Pope John Paul II (1979), and Pope Benedict XVI (2008); thirty championship prizefights--including Joe Louis-Max Schmeling and Muhammad Ali-Ken Norton; two professional soccer franchies--the USA/NASL's New York Generals (1967-68) and the NASL's New York Cosmos (1971, 1976); and college football--including the annual Notre Dame-Army game from 1925 through 1947. Stadium in the interim. The renovations by Praeger-Kavanaugh-Waterbury significantly altered the appearance of the stadium. 118 columns reinforcing each tier of the grandstand were removed, the Stadium's roof, including its distinctive 15-foot copper frieze, was replaced by a new upper shell, and a white painted concrete replica of the frieze was added atop the wall encircling the bleachers. The Stadium's playing field was lowered and shortened, with the monuments once in play relgated to a newly created Monument Park. In 2006, the Yankees began construction on a new $1.8 billion stadium in adjacent public parkland, which opened with the 2009 season. The final game at the stadium was held on September 21, 2008, with the Yankees beating the Baltimore Orioles 7-3. In 2007, Yankee Stadium was ranked #84 on the AIA 150 America's Favorite Architecture list.